Several new lifeforms were introduced in the Animated STAR TREK series and several alien species from the Original series were seen again. More than fifty types of lifeforms seen or mentioned in the animated series are listed below along with a small picture, a brief description and the episode(s) in which they appeared. Those species that were seen or mentioned in the original series are marked with an asterisk (*). Clicking on the pictures below scrolls the page back up to the navigation links below. Arex, Lieutenant. Lieutenant Arex was a member of a technologically advanced warp-capable species. Arex's people had three arms, three legs, red skin and yellow eyes. A semi-canonical biography of Arex once available from Lincoln Enterprises suggested that his people were from Edos and were called Edoans, but this name was never mentioned in any aired episodes. The character of Arex was voiced by James Doohan. The cloud being was voiced by Majel Barrett. Magen was voiced by Nichelle Nichols. The Denebian whale was never seen, but only referred to in dialogue. The character of Em/3/Green was voiced by David Gerrold. Insectoids. Spacefaring species. A starship used by these people was lost in the Delta Triangle region of space and one of its crew later served on the Elysian Council that ruled that limbo place. ("The Time Trap"). 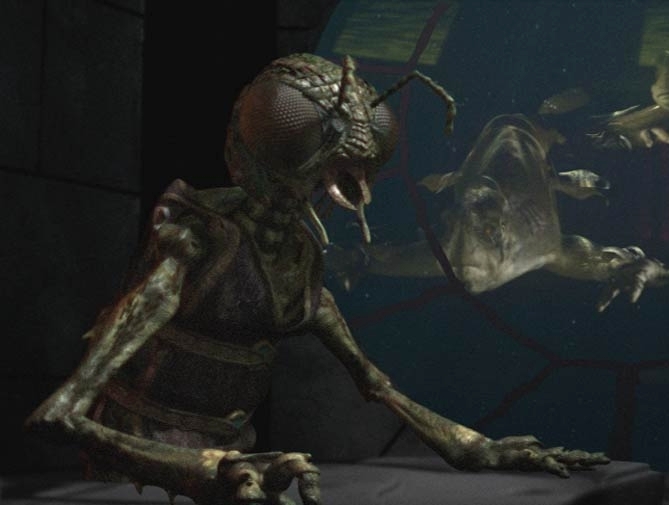 The insectoid seen in this episode may be a member of the Xindi insectoid species (pictured at right) seen in several episodes of the STAR TREK: Enterprise television series. The character of Kukulkan was voiced by James Doohan. Kzinti. Technologically advanced race of felinoid warriors. The Kzinti invaded the Sol system in 2064. They engaged humankind in wars four times before being ultimately defeated in 2069. The Kzinti were defeated because of Earth's development of warp drive. The Treaty of Sirius prevented the Kzin from possessing any weapons except for police cruisers. ("The Slaver Weapon"). Among the warlike species of the galaxy, Dr. Keniclius 5 was concerned that the Kzinti had to have peace forced upon them by the Phylosian fleet of ships. ("The Infinite Vulcan") A Kzinti ship had been lost in the Delta Triangle region and a male Kzin served on the Elysian Council which ruled over that limbo realm. ("The Time Trap"). M'Ress, Lieutenant. Lieutenant M'Ress was a member of a technologically advanced warp-capable species. M'Ress' people were felinoids, with long, thick orange-tan fur and golden yellow eyes. Her people spoke very softly and had a cat-like purring quality to their voices. A semi-canonical biography of M'Ress once available from Lincoln Enterprises suggested that her people were from Cait and were called Caitians, but this name was never mentioned in any aired episodes. The character of M'Ress was voiced by Majel Barrett. Orions. * Civilization of sentient, green-skinned space-faring humanoids from the Orion planets. The Orion's claimed to be neutral, but this came into dispute when Orion's were caught several times engaging in piracy involving dilithium crystals. For some years, a thriving trade existed for so-called Orion animal women slaves. When their missions failed, Orion starship crews often resorted to suicide to prevent capture. The Orion vessel that the disguised Thelev communicated with during the Enterprise's mission to the Babel Conference of 2268 self-destructed rather than be taken. The Orion pirate ship encountered by the Enterprise in 2270 which had plundered the S.S. Huron attempted suicide, but was prevented from doing so. The Enterprise crew captured the ship and crew. ("The Pirates of Orion") A Orion ship had been lost in the Delta Triangle region and Devna, an Orion woman, served on the Elysian Council which ruled over that limbo realm. ("The Time Trap"). Named for the episode's author Walter Koenig. "Retlaw" spelled backwards is "Walter." Romulans. * Warrior civilization from the planets Romulus and Remus. An offshoot of the Vulcan people who left Vulcan 2000 years ago to found the Romulan Star Empire, the Romulans were a passionate, aggressive but highly honorable people. ("The Survivor", "The Practical Joker"). Romulan ships had been lost in the Delta Triangle region of space, and the Romulan Xerius (pictured) headed the Elysian Council that governed the limbo space within the region. 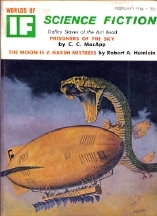 ("The Time Trap"). Sehlat's were first mentioned in the original series episode, "Journey to Babel" (TOS), but they were not seen until the animated series. 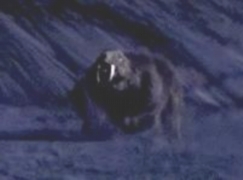 Thirty-one years after I'Chaya was seen on the animated series, a computer-generated sehlat (pictured) was seen in the November 2004 STAR TREK: Enterprise episode "The Forge.". 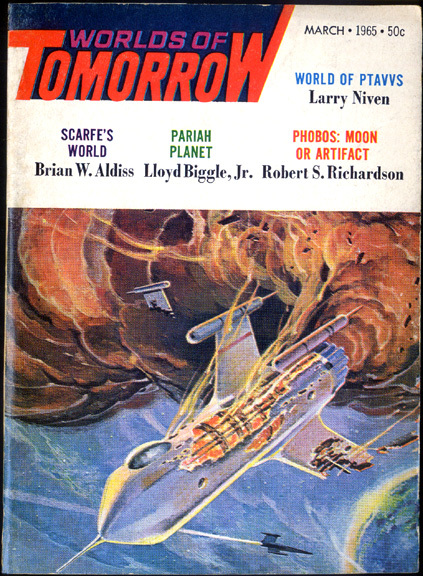 The Slavers were first mentioned in the 1965 novella "World of Ptavvs" by Larry Niven which was published in the March 1965 issue of Worlds of Tomorrow magazine. The actual name of the Slaver species was the Thrint. Sord. Member of a race of sentient two-meter tall bipedal dinosaurs. In late 2269, Sord was chosen to be part of a special team assembled by the Vedala to retrieve the Soul of Skorr, a sacred sculpture, from a mad planet. He was chosen for his strength and he actually liked the unusual topographical and temperature changes on the planet because it provided "variety." ("The Jihad") The character of Sord was voiced by James Doohan. Tribbles. * Small, furry creatures with no discernible head or limbs, with a mouth on their underside. Their fur color ranged from brown to grey to tan to white. They trilled when petted by most species, but screeched loudly whenever in proximity to Klingons. Tribbles were born pregnant, an adaptation evolved due to high predation on their homeworld. In the presence of sufficient food, they often bred out of control without predators. In 2267, tribbles were brought to space station K-7 by space trader Cyrano Jones. The station became deluged by them in short time due to their eating of the quadrotriticale grain being stored on the station. ("The Trouble with Tribbles" [TOS]). In 2269, Cyrano Jones trafficked in a pink colored breed of tribble that was supposedly "safe." Instead of breeding many individual young when overfed, these new tribbles were virtual colony creatures, creating dozens of tribbles within their expanding bodies. When sufficiently disrupted, these huge furry bags would burst to spill out their tribble colonies. ("More Tribbles, More Troubles") SEE: Glommer.